Annnd it is over. 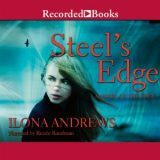 *weeps over coffee cup* Steel’s Edge by Ilona Andrews is the last book in the Edge series. Once again, I listened as Renee Raudman narrated. Fans of the series are rewarded with answers regarding Spider and the Hand in this action-packed edition. Charlotte de Nay is headstrong and her romance with Richard Mar was delightful. 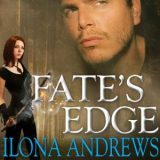 So I needed an Ilona Andrews fix and decided to begin Fate’s Edge, the third Edge book narrated by Renee Raudman while I was traveling and attended BEA. It was the perfect listen. I would plug my earphones in each night and lose myself for thirty minutes. Andrews draws me into this crazy world and creates characters that become real as their stories unfold. 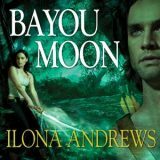 Bayou Moon by Ilona Andrews is the second book in the urban fantasy series The Edge. I have been listening to the series on audio and was eager to return. Two years have passed since the ending of the first book and we get a new couple and tale in this strange land known as the Edge. On the Edge was brilliant! 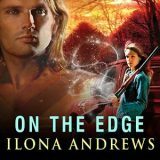 The Edge series by Ilona Andrews was on my wish list because I cannot get enough of this writing duo. After listening to Sweep in Peace and realizing there was a crossover in characters, I grabbed On the Edge, the first audio. On the Edge delivered incredible world building and a slow burning haters-to-lovers’ romance filled with delicious heat.